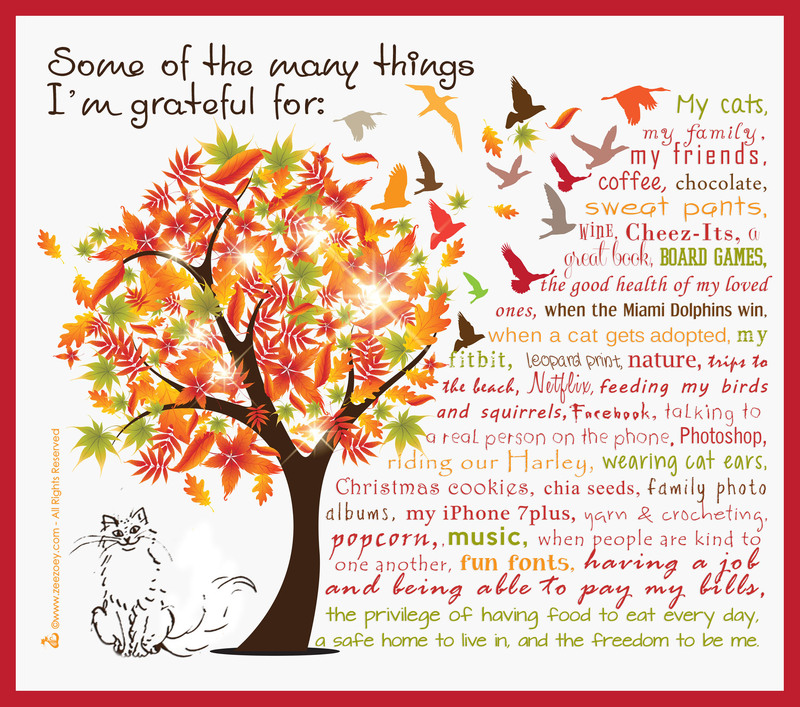 From big things, like my friends, family, and my cats, to the little things, like popcorn and leopard print, I’m grateful for so much in my life! My cats, my family, my friends, coffee, chocolate, sweatpants, wine, Cheez-Its, a great book, board games, the good health of my loved ones, when the Miami Dolphins win (this one is happening less and less), when a cat gets adopted, my Fitbit, leopard print, nature, trips to the beach, Netflix, feeding my birds and squirrels, Facebook, talking to a real person on the phone (this is also happening less and less), Photoshop, riding our Harley, wearing cat ears, Christmas cookies, chia seeds, family photo albums, my iPhone 7plus, yarn & crocheting, popcorn, music, when people are kind to one another, fun fonts, having a job and being able to pay my bills, the privilege of having food to eat every day, a safe home to live in, and the freedom to be me. How about you all? What are some of the everyday things in your life you’re grateful for? 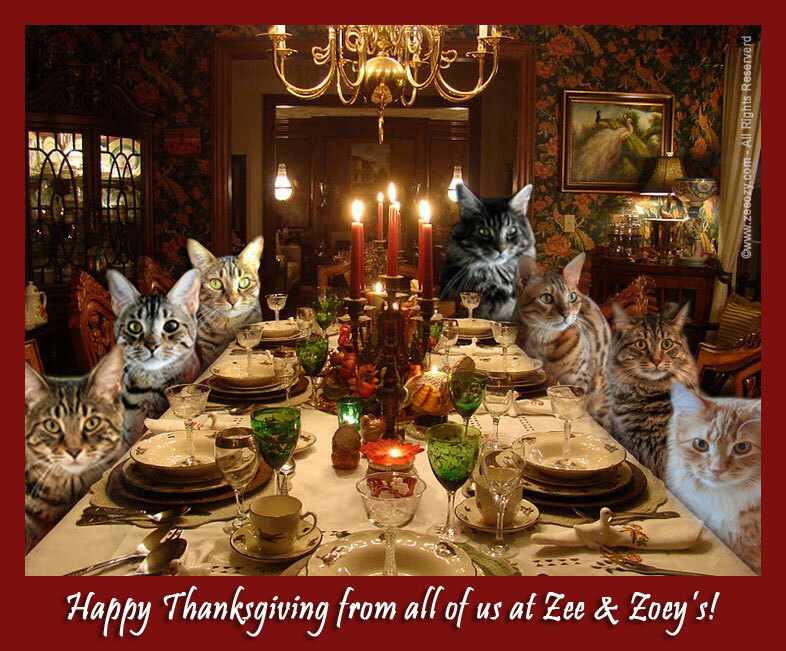 Have a blessed day from all of us at Zee & Zoey’s, and as I do every year, here’s my favorite picture of my gang for Thanksgiving and a visual reminder that despite what certain kitties might tell you, NOT ALL FOODS ARE SAFE FOR THEM TO EAT! Can someone please hurry up with this blog post and say grace so we can eat! Happy Thanksgiving to all of you from the three of us! We have lots to be thankful for here, too, and this year especially, when I think about all the people and animals affected by the wildfires in CA, I feel extra grateful for all our blessings. Now we’re hungry! Happy Thanksgiving! 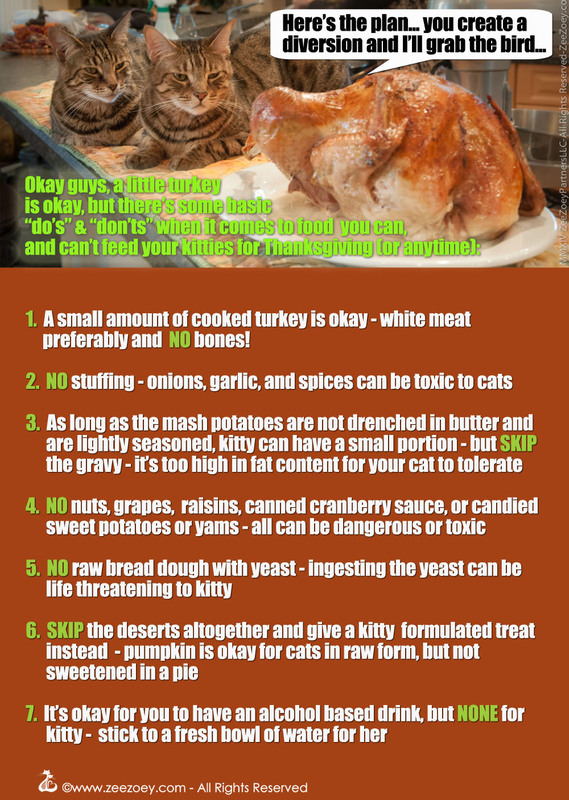 Thanks for the tips, Happy Thanksgiving! Happy Happy Thanksgiving to all of you! Wishing you and all of your beloved ones a happy holiday/long weekend and may it be enjoyed in good health, safety, happiness, and Love! Happy Turkey Day! Make sure your cats get some. Surprised leopard print is so far down the list. Just kidding. Hope that your Thanksgiving was fabulous! Happy belated Thanksgiving, dear friends!